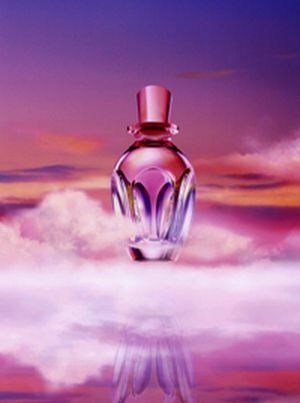 MyQueen Light Mist is a perfume by Alexander McQueen for women and was released in 2007. The scent is fruity-woody. The production was apparently discontinued. Fresh fruits in the high grass on the edge of the forest at dawn. And violets. My Queen Light Mist really is a light fragrance. It does resemble its "mother ship" "My Queen" as they both have violets, woods and patchouli, but they are not alike. The resemblance is in the base notes mostly. My Queen Light Mist is not very flowery nor an almond gourmand and it's not sweet either. It starts off with a slightly fruity sour note matched with grassy green and slightly woody notes. Currants and a few unripe apples in the field hedge. I can identify the grapefruit mentioned but it doesn't stand out as it's wont to do, but adds to the sour freshness with a wellbalanced slight bitterness. As time passes the woody notes come up more than the fruits, and it seems to be wet wood, partly green and partly dead, no dry and matured timber. Not mouldered, but a whiff of forest soil and crushed branches. Hedgeroses starting to bloom and a few violets give My Queen Light Mist a soft springlike impression. This is no flowering garden, this is a very natural edge of woodland in the spring. Everything is exudes awakening and expectations and you almost hear the dawn chorus of bird singing as the first sun rays break through the morning mist at the crack of dawn. My Queen Light Mist is a very delicate and light fragrance that stays fairly close to the skin, but it has a tenacity that surprised me. So light, I thought, it will be gone quickly, but that's not true. The green woody notes stay on the skin for quite a long time, and now and again I catch a surprising whiff of violet or fruit hidden in the high grass. Although delicate My Queen Light Mist is not smooth and pliant, it's unsweet and fresh without being acerbic, a bit like green tea. I was pleasantly surprised by this fragrance as I had other expectations on reading the pyramid of fragrance notes. If this is supposed to be the queen, it's a queen out stalking but not hunting. She left her guns at home, and her corgis as well. She set out at the break of dawn, slipped on her waxcoat and wellies and strolls through the meadows wet with dew over to the forest edge in order to watch the deer and enjoy the fresh and misty air and the peaceful early morning. The bottle is an eye-catcher. Dusky pink glass with a filmy shimmer and cut-in indentations like you find in old-fashioned lemon squeezers. The flacon sits easily in my hand and is comfortable to use as the spray-head made from dusky pink plastic has a slightly concave sloping top onto which my fingertip settles comfortably all by itself. Very user-friendly and decorative at the same time. Write the first Review for MyQueen Light Mist!